The OSF was established in Budapest in 1984, and currently employs about 100 people. On Thursday, April 19, 2018, Patrick Gaspard announced to Die Presse  that the OSF would close its doors in Budapest and move to Berlin. 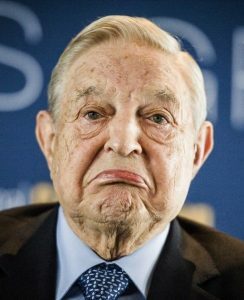 Having been at the heart of the political debates in Hungary for a little over a year, the action of George Soros through his organized network has been denounced many times by the Hungarian government  and Prime Minister Viktor Orbán in particular, who designated him as the main political enemy of Hungary. In particular, the OSF supported and promoted the migratory influx that Hungary has been forcefully opposing since 2015. George Soros’ networks have been the subject of numerous scandals and has been accused of interference, manipulating opinion, and even of civil disturbances and destabilizations of legitimate governments  in many countries, especially in Central Europe. The stated goal of the OSF and George Soros is to everywhere encourage the advent of the “open society”: a liberal-libertarian concept calling for the deconstruction of nations, democratic sovereignty, religions, and the traditional family. The announcement of the withdrawal of the OSF from Budapest, two weeks after the re-election of Viktor Orbán , is not insignificant. On March 15, the strongman of Budapest announced  that after the elections, he would “seek moral, political, and legal amends” regarding all the declared – or presumed – supporters of George Soros and his liberal-libertarian networks. Last week, a media organ close to the government, Figyelő , published a list of Soros’ influential people in Hungary. This article is reprinted from the Visegrád Post  dated April 19, 2018.